Let’s take a look at how these fertilizers work and help differentiate between the available types. EEFs are products that allow increased plant uptake and reduce the potential of nutrient losses to the environment (via gaseous losses, leaching or runoff). Bob Hartman, director of sales and marketing for Knox Fertilizers, says regarding nitrogen, there are several types of EEFs, including urease and nitrification inhibitors (products that can coat a urea prill or be homogenously distributed throughout), sulfur- and polymer-coated nitrogen (coated urea prills) and slow-release nitrogen fertilizers, such as methylene urea, composts, biosolids, manures and litters. 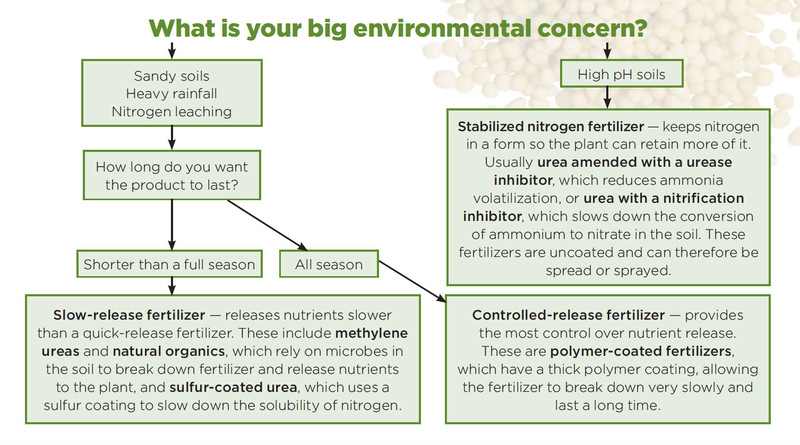 Miltner suggests that LCOs consider how long they would like their fertilizer to last and that they examine the soil and environmental conditions and understand what is in their bag of fertilizer. With the higher cost of EEFs, Hartman recommends technicians calibrate their spreaders correctly, so they do not over- or underapply product. Don’t keep the same spreader calibration settings from product to product, Miltner cautions. Every product flows differently through the spreader, even though they may have the same percentages of nutrients.